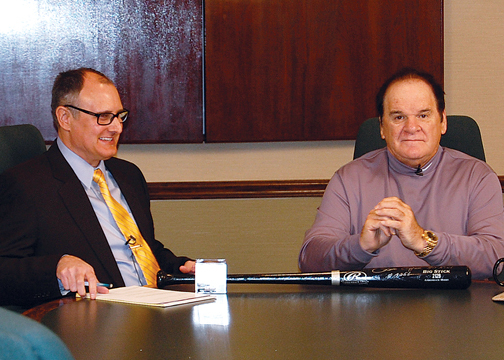 Clermont County Convention and Visitors Bureau President Mark Calitri, left, interviews Pete Rose. Sometimes in one’s life, whether by chance or fate, you might have the opportunity to meet your hero. Someone who is extraordinary, bigger than life, and has achieved the so called impossible. I had this special opportunity recently for an exclusive, all access interview with the “Hit King” Pete Rose. Our rules…there were none! I questioned Pete on topics that I’ve never heard him asked before. In this exclusive series we’ll talk with the “Hit King” on everything from why the Cincinnati area is his favorite to his thoughts on Miley Cyrus and Justin Bieber, and his biggest regret.